I often say, Arkansas Flag and Banner is my first born. Then I had 4 real children. Today, at 60 years old, I gave birth to my 6th pseudo child, BRAVE Magazine. When passing out my beautiful, bi-annual, glossy periodical at restaurants and lobbies, I feel just like a proud momma. Can you tell by all the adjectives!?! The idea of our own magazine came earlier in the year. Like all good business owners, I am not thinking about today but the future. What is AFB’s future position in the flag industry? 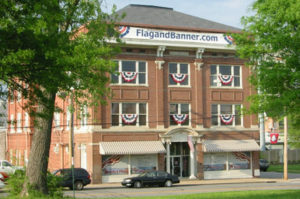 Since my purchase of the internet name flagandbanner.com in 1995, I have been focused primarily on internet sales. With internet retail being almost 20 years old, it is time to think of something new. IKR! I started Arkansas Flag and Banner in 1975 with a small yellow page ad and door to door sales. When gas prices exploded, I begin to invest what was once my gas allowance into yellow page advertising in the surrounding states. Soon Ma Bell (aka southwestern bell) was deregulated and with long distance calling now affordable, I moved to telemarketing. With the increased sales I was able to hire outside salespeople and pursue tradeshows. Next came the revolution of data collection and targeted mail- marketing campaigns ensued. When I heard of the about the internet in 1995 I quickly changed my focus to internet retail. So what is the next hook for Arkansas FlagandBanner.com. Opening the mail one evening, it hit me: a magazine about us and our customers. Over the past 40 years I have heard a lot of great stories from customers and employees. Each week, the employees of AFB and I gather for a 7 am, Monday Morning Meeting. Often the general talk will bring up a story from the previous work week. We’ve discussed sharing these stories through blogs, Facebook, and then it came to us, why not a small magazine? It rang true. 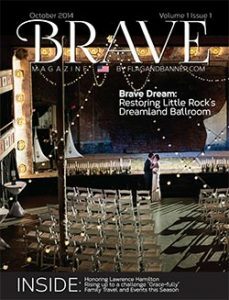 That night an employee dreamt the magazine’s name was BRAVE and boom the concept was born. We all have a story to tell. We all start lives brave. Brave to be born, to take our first steps, to go school for the first time. Being brave happens at all ages and can be on any level. When I passed out my first edition of Brave Magazine at Woodland Heights Retirement Center, where my 91 year old mother resides, the ladies challenged my concepts the elderly often do. They demanded, “I am not brave.” I disagreed, and asked “Weren’t you scared to move here to Woodland Heights? And suddenly they all felt Brave. Most of us think about Brave as a word used to describe someone facing great danger or challenge; brave to go to war, to run into a burning building, to serve and protect. But there are all kinds of brave: brave to face a debilitating illness, or accept death. And then there’s life changing brave; brave enough to change jobs, start your own business, move, get divorced, or even change yourself. Well you get the idea. This magazine is about being Brave in Life. So here we are, months later, with a 32 page magazine full of hard work, excitement, creativity, challenges and yes, our own Bravery. Making this magazine and working with my great staff at AFB has re-energized me in my career. Â I look forward to work again, which can only be good for my employees and customers. Can’t wait for Edition 2 out in Spring 2015! It is already in the works and I am jazzed about its content! You’re gonna love it! 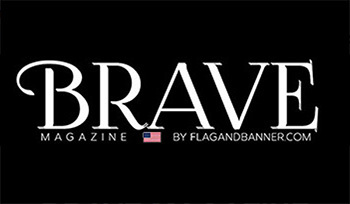 So check out the Brave Magazine website at www.bravemagazine.com and share your brave story with us! Kerry McCoy is founder and president of FlagandBanner.com and owner of Taborian Hall where Dreamland resides. She is also publisher of Brave Magazine. If you would like to interview Kerry or have her speak at your event contact tammie@flagandbanner.com.